Fence Factory Rentals has long set the bar for temporary fence rentals and portable toilet rentals for construction sites in and around Atascadero, CA. From the very beginning, we’ve been fully committed to delivering top quality, dependable products and services at highly-competitive rates. With almost two decades of experience providing porta potties and temp fencing for countless commercial, industrial and residential construction projects in Atascadero and San Luis Obispo County, we’re perfectly equipped to handle your needs, no matter how basic or extensive. Please note that our location also offers premium fencing materials in Atascadero and the surrounding cities. 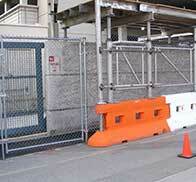 Our reliable Atascadero temporary fence rentals are ideal for securing perimeters around construction sites, as well as preventing anyone from getting into areas that are unsafe and may potentially pose some danger. The last thing you want is for someone to get injured or your job site to be vandalized. We have numerous Atascadero rent a fence options available for your construction project. Our popular post driven chain-link fencing is very sturdy, and well-suited for providing site security over a long span of time. This construction fencing can be augmented with tension wire for enhanced strength, barbed wire (proper zoning required) as a deterrent against trespassing, and flat-link wire for protection against injury. As the spread of rocks, dirt and other debris is of concern at many construction sites, we have effective debris netting that will keep everything properly contained. If your construction job is shorter in length and does not necessitate strict security, our freestanding chain-link fence panel rentals in San Luis Obispo County may be a good option as well. These linked-together panels give you flexibility in configuring the fence, and can be bolstered by adding sand or gravel bags at the base. If you’re looking to keep your work site as private as possible, we have both privacy screen and privacy slat panels available to rent. In addition to temp fencing, our company also provides numerous high-quality options for portable toilet rentals near Atascadero CA. All of our construction toilets are carefully examined and cleaned before being delivered, and we offer routine service for them over the duration of the project. Fence Factory Rentals Atascadero currently offers six types of construction porta potty rentals for your workers to use: standard toilet, deluxe toilet, handicap toilet, towable toilet, high rise toilet and hoistable toilet. Our most rented option, the standard San Luis Obispo County construction toilet features anti-slip draining as well as fresh scent fragrance discs to keep the units smelling good over time. For a 5-day work week, you should have 1 unit for about every 10 workers at the site. Please note that you’ll need to rent hand wash stations separately. A step up in numerous ways from the standard toilet, our deluxe toilet has a hand wash station with soap and water within the unit itself along with a non-flush toilet and urinal. We highly recommend this particular Atascadero toilet rental for small or even medium-sized construction crews. If you’re working on a large project with a lot of workers on site, we believe that you will be better off renting the standard units with the separate hand wash stations. Our towable construction toilet rental around Atascadero and San Luis Obispo County is ideal for situations in which workers go from one location to another. Easily mobile, particularly with the available reversible tow hitch, this incredibly useful unit has a sink built right into it. Our high rise toilet rental is perfect for use at multi-level structures. This unit is very comfortable despite being only half the height of the standard unit, and travels from floor to floor using the freight elevator. If moving from floor to floor is very difficult or even impossible, our hoistable toilet can be effectively lifted by a crane and situated where appropriate. When disasters or other emergency situations happen in Atascadero or elsewhere in San Luis Obispo County, Fence Factory Rentals is ready and able to provide any kinds of perimeter fencing, crowd control barricades and portable toilets needed by the response team(s). We care deeply about our community, and will do everything we can to be of assistance. Our emergency services are available 24/7, and we are committed to mobilizing our resources as quickly as possible. Fence Rentals serving Atascadero, Templeton, Buellton, Creston, Lompoc, Morro Bay, Solvang, Paso Robles, Cayucos, San Luis Obispo, Salinas, Monterey and Los Osos areas.